Until a guard shows up! The digital future of museums happens without the museums. Just a few steps separate the past from the future at the Royal Museums of Fine Arts in Brussels. In the past, you paid a 13€ entrance fee, stood in a queue and got scolded by the guard if you dared to get too close to an Old Master to examine a detail. The future, on the other hand, is accessible free of charge. Stride quickly through the majestic hall — it begins in a large room at the back, to the right. It’s quiet here, in this rectangular exhibition room painted blue. Works by Pieter Bruegel the Elder from various museums around the world are projected onto the walls. They are 450 years old, often surprisingly small. Suddenly one of the paintings grows larger. The whole room zooms into the painting, which now covers all of the walls. Details that never would have stood out before become visible: I can make out the dots on a gambler’s die. The painting slides to the right. A man greedily snatching a fish directly from the water comes into view: “To catch fish without a net” is the proverb Bruegel has illustrated here, roughly meaning, “To profit from the work of others”. Profiting from the work of others — this, of course, is a major issue for virtual museums (as well as in the debate around digital cultural heritage in general). Do institutions like Europeana and the Google Arts Institute purely profit from cultural institutions, some of which have amassed and curated their collections over the course of centuries with the help of donations or taxpayer money? Is a museum that allows third parties to digitalise individual works or entire buildings selling its soul? Often at a price: not only the museum itself, but the third party too can capitalise on the digitisation immediately. Create a virtual exhibition or generate advertising revenue? Or are the Googles/Europeanas of the world important innovators that can ensure that art is also available in the digital realm, widely and free of charge? There is no conclusive answer yet in the sector. What is clear, however, is that cultural institutions are not taking the lead in the debate. State and city museums in particular generally do not have non-project-related marketing budgets or Chief Digital Officers and fail to implement good, innovative ideas from the very start due to a lack of staff. 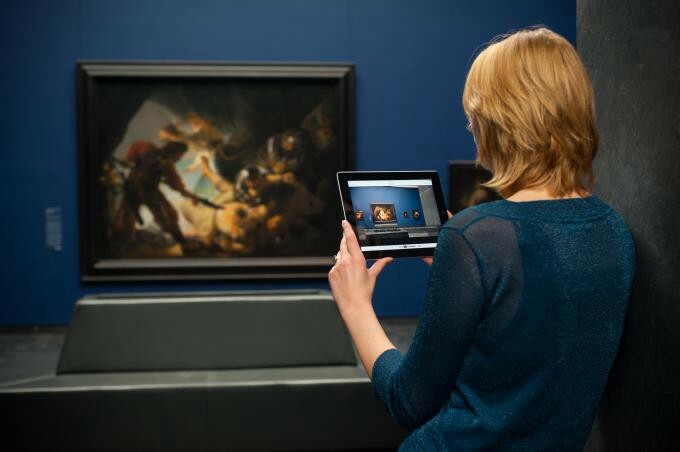 Few institutions in culturally rich countries like Germany have taken even the first steps, offering digital services online and on mobile devices, like Frankfurt’s Städel Museum does. I can order reprints of images or scan a painting with the app to download additional information. And it generally works quite well. At least until a strict guard storms over to me (the ominous digital customer) and barks, “No photography allowed!” I swear, this really happened. Digital platforms backed by strong investment, the private collections of courageous patrons of the arts and a few token (usually Anglo-Saxon) museums like THE MET stand on one side of the cultural digital divide. Public institutions, which for the most part depend on systems of funding that were worked out decades ago and which are bound to complex cultural policy structures, are on the other. What is clear is that the digital transformation is not stopping for high culture. Having shaken up music, books and film, it is now knocking on museum doors. For museums, as places of cultural experience, space-based technologies are especially relevant of course: 3D scanning, 3D printing, augmented reality and, last but not least, virtual reality. 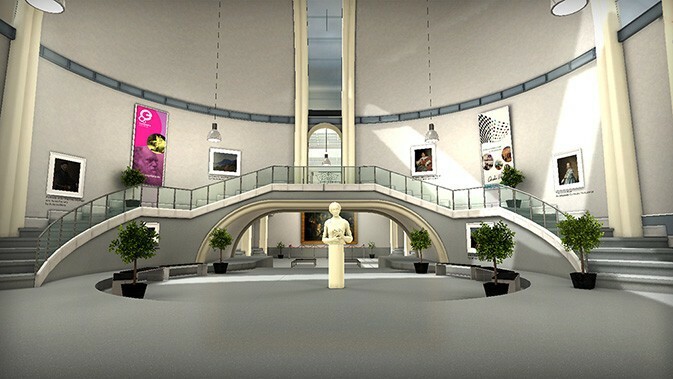 Exciting projects for virtual museums and exhibitions have already been around for a few years. Yet it is only now, with the widespread penetration of VR headsets, that a cohort of people interested in art and who will regularly go in search of virtual art kicks is coming of age. The number of related films on YouTube and Vimeo and the sales figures for VR headsets seem to point to rapidly growing interest. How VR is used for art varies significantly. The artwork itself, the institution or a new room that is a “compilation” of pieces of different origins can all be transformed into VR. I’ve selected a few examples here. 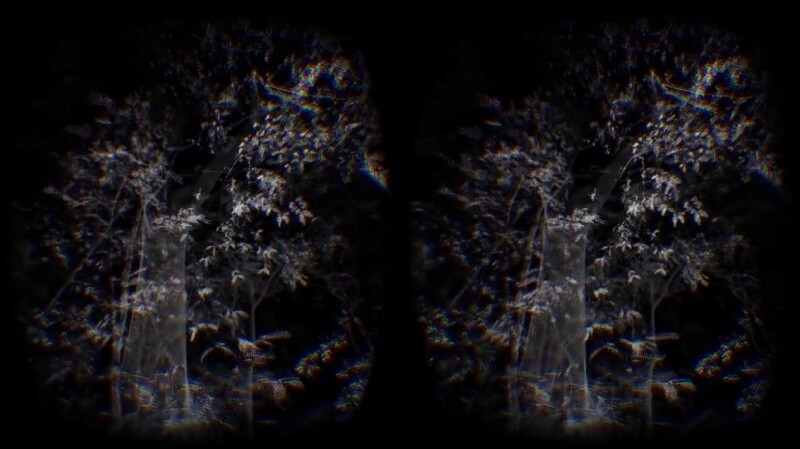 Phantom is a virtual reality environment that you can enter through an Oculus. When you’re wearing the headset, you find yourself in Brazil’s Mata Atlántica rainforest, one of the most rapidly disappearing natural habitats on earth. Steegmann Mangrané wants people to be able to experience the rainforest without actually going there and disturbing it. He wants to show us details of the habitat that we’d probably overlook even during a real visit. The installation itself, which could hardly be any more different from the content of the work, is also interesting of course. Here: a white cube with an Oculus headset and demarcations on the ground. Attached to the headset and connected to the ceiling via a cable, staggering around the room, the blind user. There: a mysterious, dark jungle with its wide range of fauna, which the user can zoom in on to discover and experience — virtually, at least. For the exhibition “Phantom” at the 2015 New Museum Triennial in New York, the artist Daniel Steegmann Mangrané collaborated with ScanLAB Projects in London, which describes itself as “UK’s leading provider of large scale 3D scanning”. It uses the Optitrac Tracking System to determine where in the space the user is located and to provide a completely realistic and immersive experience. ScanLab’s showreel itself also offers an impressive overview of what’s possible by combining digital technologies such as VR headsets, 3D modelling and motion tracking. 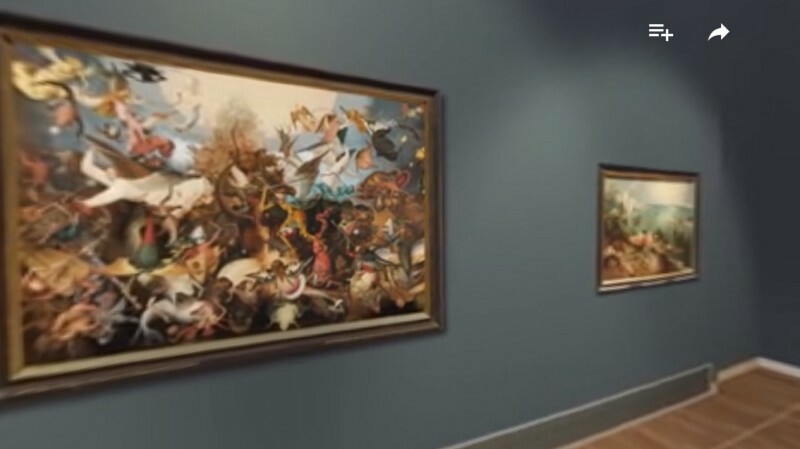 As mentioned at the outset, the virtual Bruegel exhibition aims to give viewers a glimpse into the Netherlandish painter’s work that many museums can’t offer: The exhibition allows us to zoom in on paintings to see details; compare, side by side, paintings usually separated by thousands of miles; and experience animated versions of individual works that have been turned into videos with audio commentary. The latter sometimes borders on kitsch, and what the added value is of having the archangel’s sword swing constantly up and down escapes me, but it is nonetheless immediately clear that this new way of presenting art offers many didactic advantages. After all, it transforms the storytelling. VR experiences in museums are often a mix of film sequences, audio explanations, texts and above all images. This density of information, together with an immersive spatial experience, calls for assistance in navigating the space and experience. Art that is actually two dimensional becomes three dimensional, not to say time-based — since we move closer, zoom in, pan, are accompanied by music, etc. This presents a major challenge for creators of virtual exhibitions, who have to resist prioritizing the technology over the content or producing creations of their own based on the existing work. The Europeana Foundation’s EUSEUM is almost three years old. As a result, technically it’s not that impressive as VR projects go: you can walk around a virtual museum room and get close to the paintings. Yet as a case study of a publicly financed European platform for cultural content it is all the more interesting. “Imagine being able to visit the Louvre, the Rijksmuseum and the Guggenheim all in one day! Imagine looking at the world’s most famous masterpieces from your favourite chair in your own home” — this is how the creators of the pan-European project describe it. Which illustrates what is likely one of the major strengths of virtual museums: the fact that the work is completely independent of location. And it is precisely this that makes it clear why museums have good reason to get involved and to actively participate in shaping the future. For, if the work is independent of location, location also becomes increasingly unimportant — the museum as a collecting entity loses its raison d’être. A comparison comes to mind: Museums then become like music albums, which have been replaced by iTunes. Instead of viewing a predefined collection in a building, in the future it will no doubt be exciting to visit a personalised museum containing a collection exclusively for me — nothing but blue paintings, for example, or only works by women photographers over the age of 70. There are a few rules in the digital world. One of these states: Whatever can be digitised will be digitised. A second: Whatever is digital will be shared. And a third: It isn’t those who produce the content who earn the big money, but rather those who spread it. This is the source of the attack on the business model of museums. And, please: I don’t want to hear anyone claim that culture doesn’t have business models! Collecting money from various sources in order to be able to offer a cultural experience by building and researching a collection — this is a bona fide business model. While the financial returns may generally be meagre, the social returns are high — and these, too, can and should be measured. What are examples of some commercial activities that might be conceivable by virtualising our experience of art? For museums to stay away from or spurn these technologies would thus clearly be misguided. Luckily, it’s rarely a lack of enthusiasm or ideas that is to blame for failure. Rather, those responsible simply finally need to make room for concepts of innovation in their institutions. Financing models — from private to commercial to public — need to be combined in clever new ways. Art and the creative industry need to work together since the digital (re)production, exhibition and distribution of architecture, art, design and photography are not really all that different from one another. There are many areas of overlap here, and thus also new business areas for creatives. And one last thing: It’s high time we found a different term for “cultural content”, which really just sounds so unappealing.